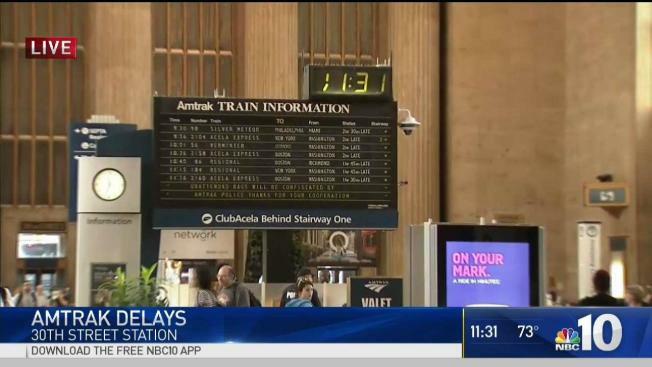 Commuters who use Amtrak's Northeast Corridor had a rough start Wednesday morning when service was suspended between Philadelphia and Washington, D.C. after two rail employees were killed on the tracks. Two employees for freight rail line CSX were struck and killed by a southbound Amtrak train as it approached Washington, D.C.'s Union Station at 11:55 p.m. Tuesday, Amtrak and CSX officials said. The 121 passengers and crew on-board the Amtrak train were not injured. But they described hearing the incident moments before the workers were hit. "We heard the horn blow and about three seconds later, we heard this 'thump, thump'...like a clunking sound. And my wife thought she had heard something hit the window next to her," one passenger on the train told NBC Washington. The ongoing investigation into the deaths forced Amtrak to delay the start of service through the morning rush Wednesday. Train service between Philadelphia and Washington, D.C. began running just before 9 a.m., but an Amtrak spokesman said there were still many delays remaining.